The Essence of Hinduism is so planned and arranged that each section naturally leads to the next one. The first chapter examines the moral basis of Hinduism. The nature of the universal Moral Law or Power that sustains the universe is described in the second chapter. How can a seeker come face to face with the Supreme Spirit - through faith or trained reason or a judicious combination of both? An answer to this conundrum will be found in the third chapter. The Bhagvad Gita is an Upanishad, a text on Brahmavidya and an exposition of yoga-shastra and no book on Hinduism can be said to be complete without a reference to it. 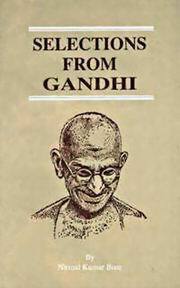 In fact it can be said to be the only book which harmonizes all the approaches to the Supreme and hence Gandhiji's views on Gita find a place of honour in this Collection. The beaten track so familiar to all and so easy for all to tread, viz., Nama and prayer is dealt with in the last chapter. This Book is primarily meant for lay readers and Hindu boys and girls attending English medium schools and brought up in families without any religious background, or in which religion has a minimal influence. As such, it will serve as an introduction to Hinduism. For further study, the interested reader may refer to the exhaustive collection in three volumes titled in Search of the Supreme by Gandhiji.